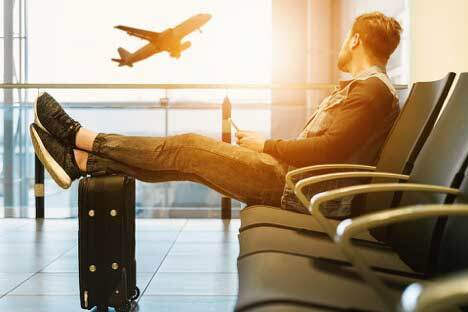 Whether you’re jetting off on a dream holiday, a short city break, or even a business trip, travelling with vaping devices and e-liquids can be confusing because of blurred lines on rules and regulations when using electronic cigarettes. Generally, airports do not allow vaping apart from in the designated areas for smoking, but keep in mind that vaping should be legal in the country you’re in as some prohibit the use of vape pens completely. It’s always a good idea to check with your airline, and the airport before travelling to ensure that the use of vaping equipment is allowed. A vast majority of airlines allow e-cigarettes on board an aircraft, but only in your hand luggage, or carry on baggage. Vape batteries are banned in checked baggage worldwide, so ensure that you have not packed any spares in your bigger suitcase. Alongside this most airlines now will not allow you to charge an e-cigarette on board an aircraft, so if you know this will be an issue for you it would be worth planning ahead. E-Liquid can be taken onboard an aircraft in your hand luggage as long as it falls below the maximum size of 100ml, and keep in mind that your e-liquid will also be a part of the maximum 1000ml you can take onboard in the cabin. You can take larger bottles in checked luggage if needed. For hand luggage, your e-liquid should be placed in a plastic bag with your other liquids such as toiletries. Simply put, we know of no airline in the world which allows passengers to vape whilst onboard an aircraft. Doing so could result in a fine being issued or in some places even jail time. The penalty varies depending on the destination of the aircraft. Despite vapour not typically setting off smoke alarms, it can happen, and we strongly advise not even stealth vaping in the toilets as the risk isn’t worth it. Unfortunately, some countries are not as welcoming of vaping as others, and in some it is banned completely with hefty fines as penalties. Below we have listed the countries currently known to have banned e-cigarettes. Those are the countries where vaping is explicitly banned by law, they do not include others which may impose less severe restrictions around vaping, but restrictions, nonetheless. You may also find reports on travellers having no issues vaping in the countries noted above, but regardless, it is still against the local laws and stories of heavy fines and imprisonment are not unheard of. Ultimately although guidance exists on vaping in vast amounts, vaping rules in other countries can be confusing and the only way to be 100% sure on the rules and regulations you’ll need to abide with is to speak with the airline you’re travelling with, the airports you’re travelling to and from, and of course the local authorities in the country you are visiting. This way when vaping in public, or in private, you can be confident that your vaping experience isn’t going to get you in trouble.